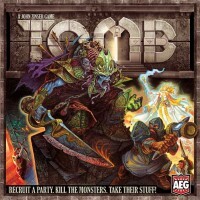 Tomb pits opponents against one another in a fast paced board game of monsters, traps, and treasures. After assembling your party from a plethora of random characters in the Inn, you set out into the Tomb. The Tomb is created as the game begins, with each player hiding treasure, traps, and monsters in each crypt, unknown to the other players. Do you remember where you left the chest of gold? Better hope your opponent didn’t put a Pain Eater in the same crypt! No rogues at the Inn today? Hope you don’t run into a poison dart trap! Tomb captures the fast-paced feel of a dungeon crawl without the hours of set up before hand. Just grab your party and go. Each character brings unique abilities, and with the map changing every game as well as the available characters, no two games will ever be the same. I wrote the review back in 2009 for Amazon. It was the first board game that I bought since I was finally able to pay off all those student loans and go back to collecting board games. I got together with a couple of buddies to try out a new board game. TOMB is a fantasy board game/RPG where your objective is to “Recruit A Party. Kill The Monsters. Take Their Stuff!” It’s like a cross between Diablo and Dungeons & Dragons on a table top. The objective of the game is to net the most EXP points by clearing traps, killing monsters and finding treasure. The game ends when the entire TOMB has been emptied of its contents. Setting up the board is simple. You place INN cards in their respective area then everyone takes turns placing TOMB cards face down in the Crypts on the board. Each player then draws 5 HEROES at random then selects a primary HERO. The remaining are placed in a pool and a draft takes place. There are 4 different HERO classes with each class focusing on a particular trait. Fighters focus on attack, Mages use magic via spells, Clerics are holy beings armed by the strenth of their prayers and Rogues are highly skilled in the arts of theivery and tactics. In addition, each HERO has his own unique special ability. There are multi-class HEROES who can act as swiss army knives, giving you the traits of 2-3 HERO classes. Players start the game in the inn. They can either draw 2 INN cards, a combination of Spells, Items, Tactics, Prayers to better equip their party. Or they can enter the TOMB and start their adventure. Once a player is in the TOMB he can move to a crypt and break-in. Depending on the TOMB cards placed in the Crypt, the player can encounter a Trap, Monster or Treasure or a combination thereof. A player must disarm the Trap and kill the monster to recover the treasure. Failure to disable a trap leads to various penalties from losing your turn to getting a character in your party killed. Monster battles are the meat and bones of the game. You need a well balanced party to handle the mid to high level monsters. Combat is done by rolling a combination of dice, Green, Blue and Red. You receive a number of dice based on you character and the equipment that he has. Scoring a hit means that the monster takes damage. Player and monster take turns attacking each other, with the monster getting the first swing, until one of them is dead. Killing the monster gets you the corresponding EXP. Losing gets your hero killed, he loses everything he has equipped. A new hero spawns in the INN and you have to go back to recruit him. Or you can choose to continue in the TOMB with fewer party members. The player with the most EXP after all the crypts are emptied wins. It’s been a while since I’ve had this much fun with a board game. I’ve tried most of the new board games out there. World of WarCraft, StarCraft, Descent . . . these games cannot compare to TOMB. If you’re looking for fun with some buddies, break open a box of TOMB! I have heard of several issues with the timing/trigger rules of the game. Majority of the players in my group are Magic: The Gathering players and we had very little difficulty resolving the various special abilities of each hero. I strongly suggest that you download the FAQ from the AEG website to better understand how to resolve these conflicts. I am always up for a game of Tomb. I have to say, I consider this game to be one of AEG’s triumphs of gaming, a game that provides a unique experience in the venue of dungeon crawling. How, you might ask? Well, Tomb is a game that not only puts you in the role of adventurers looking for riches and loot, but it also places you in the role of being the crypt master, placing monsters and traps in the path of your opponents. The object of the game, like many others, is to accumulate the most Experience Points (Victory Points) by the end of the game, which only ends when the last crypt is empty. To start the game, each player draws 3 cards from the crypt deck for their opening hand. These cards can either be treasure cards, trap cards, or monster cards. Each player takes turns placing one of those cards in a crypt location face down, then draws another card to replace it. Each crypt has a maximum number of crypt cards it can hold, from 1 to 5. Once a crypt is full, no more cards can be placed there. This continues until all the crypts are full, and then the next phase of the game begins. Players who have placed a card in crypts that can only hold one card will have an advantage of knowing exactly what is in that crypt, while crypts in which players did not solely place all the cards always contain a surprise for everyone, whether good or bad. Treasure Card: Usually a weapon, armor, or artifact that will assist the player and his team in the conflicts ahead. Contains an inherent XP (experience point) bonus that needs to be ‘banked’ to collect. Trap Card: A hazard in the dungeon that usually has a one-time effect if it cannot be disarmed. Usually requires a skill test of some sort to disarm, and the trap (if it goes off) can be relatively benign or extremely lethal, depending on the card itself. Also contains an XP value; if disarmed, the player gains the value. If not, the player gains nothing. Monster Card: A creature with a health value and stats comparable to the adventurers themselves that will usually attempt to harm the adventurers when they enter the tomb. May also have a special effect associated with it. Contains an XP value that is usually awarded to the player that managed to defeat it in battle. The next phase of the game involves party building in The Inn. Now that there are treasures to be won, players need to recruit members into their party to actually find them. Tomb comes with no shortage of these characters; in comparison to other games, the plethora of characters are actually quite excessive! Characters in Tomb are represented with rectangular cardboard pieces with a character portrait on the front and the character statistics on the back, depicting what each character is and what special abilities they might have. Each character in the game falls into four distinct classes: Fighter, Rogue, Cleric, and Wizard. Some characters are a combination of two of these classes, but there are no more class types than this. Fighters can usually handle combat well and take hits, Rogues have better than average trap-disarming skills, Clerics can buff (game-speak for enhance) and heal party members, and wizards can cast destructive spells or cause interesting effects. Each character has four basic attributes: Attack, Skill, Magic, and Holiness. In addition, each of these attributes has three color-associated areas: Green, Blue, and Red. Tomb comes with a variety of specialized 10-sided dice that match these colors. The green dice have 3 success symbols on them (success symbols are represented by axes), the blue dice have 5 success symbols, and the red have 7 success symbols. A character may have a number in one or more of the color-associated areas of their attribute section; if they do, then they may roll that number of dice of that color when that attribute is being used. For instance, if a rogue was attempting to disarm a trap that required a skill check, and the rogue had the number 3 in the green area of Skill and 2 in the red area of Skill, then the player would roll 3 green dice and 2 red dice to see how many successes he could get on those 5 dice. Since red dice have the most chances for success, red dice are usually the most desirable in any attribute. Attack is used for trying to inflict melee damage on monsters, or for making attack checks versus traps. Skill is most commonly used for disarming traps, though some weapon attacks can be affected or enhanced by Skill. Magic is used for spell effects cast by Wizards, and can also be used to make Magic checks versus certain traps. Holiness is most commonly used with Prayer spells cast by clerics, and can also be used for some traps and effects. Item Card: These cards represent basic adventuring gear. Weapons, armor, that kind of thing. Not as powerful as some of the treasure cards in the crypts, but can make characters stronger or more durable. Tactics Card: These cards represent unique abilities that can be used during the game, some one-time effects and some constant. Examples are the ability to double-team a monster during an attack, or being able to disarm a trap without requiring a roll. Prayer Card: Divine spells that can be cast by a Cleric. Can heal party members, make party members temporarily stronger, and even bring characters back from the dead. Clerics get a Prayer card for free when they are recruited. Spell Card: Arcane magic that can be cast by a Wizard. Can cause damage, charm monsters, or even interfere with other rival adventurers in the Tomb. Wizards get a Spell card for free when they are recruited. A player may recruit no more than 5 members into their party, but can venture into the Tomb with as little as 1. Each party has a base move of ten spaces, and can move around the game board to try and reach whatever crypts they can find. Once a crypt is found and entered, the crypt cards are passed to the player to the immediate left or right of the adventuring player (the crypt itself will indicate which.) The player who holds the cards is the crypt master for the turn, and will coordinate all of the good and bad things that happen in that crypt. Traps are encountered and resolved first, then monsters, then treasure, in that order. After checks for traps are made (if any are present), the crypt master will roll any attacks made by the monster(s), which will also feature the type of dice used on their attribute list. Each success rolled will deal one wound to a character (unless specified otherwise). Characters will respond in kind, rolling their dice to wound and kill the monsters. If all the monsters are defeated and there are characters still left alive, the party will collect any treasure left in the crypt. In this way, the crypts are systematically looted until the game is over. Tomb offers a HUGE amount of replay factor, more so than any game I have ever seen to date. The Crypt deck is huge, and throws many different surprises into the game. Couple this with the fact that your opponents will have in-game knowledge that you lack (and vice-versa), and you will find yourself often watching your opponent to see where they are headed as much as you follow the game itself. The amount of characters to choose from in the game is massive, and you will find yourself having a unique party with each playthrough. The game also has two difficulty levels, with the board boasting a second side that has crypts that contain varying different effects upon entry. The game offers so much to do without being overly clunky or inelegant, that it’s easy to get into and enjoy. This game also offers a lot of strategy; players sometimes have to make a choice between going into the crypt early and taking their chances, or building a strong party to go after rooms that will almost certainly pose a challenge. Tomb does, however, suffer from one or two little issues. The instruction book is…not as friendly as it could be. Also, if a crypt is entered that has a mass of monsters in it, combat can be a tedious affair; monsters tend to come with a variety of effects, and some can be quite difficult to take down. The game’s strength is its variety, but the sheer number of special abilities and effects can sometimes be hard to remember. I can easily forgive these issues, however; the game compensates with combat by having another player participate in combat as the opposing crypt master, so it keeps players involved, and other players can review their own battle strategies as things unfold. And the effects tend to balance themselves out as you go and become more familiar with the characters. Towards the end of the game, players are fighting for every inch to try and claim victory, and very often it can come down to a matter of points. I highly recommend this game for anyone who enjoys variety and a certain random element to their gaming. Tomb is a fair game; you start the game with a certain knowledge of what is in some of the rooms you will be exploring, and it’s up to you whether you use that knowledge or not. Though you might not always get the characters that you want, there are plenty of characters that are good at what they do, and anyone can make an effective party to venture into the tomb. This game is competitive, but very rarely is it actively competitive against other players. Most of the time it boils down to the choices you make and how you deal with adversity. And I really like that. Add a Review for "Tomb"